Maurice's House (Mauritshuis in Dutch) in the centre of the Dutch capital, The Hague, is a beautiful example of Dutch classicist style. It is a house built for a 17th-century prince, Maurits van Oranje. Walk across the forecourt, take the glass elevator or the daylight-flooded stairs down, secure your ticket, and mount the broad, sumptiously carpeted staircase to level 1. You can feel the power of the building raise you to a higher state of being literally and metaphorically. Your audience will be with the paintings of the Dutch Golden Age rather than a royal prince; and with the work of the renovation architects, Hans van Heeswijk architecten (the building reopened to visitors last year); as well as with the work of director Emilie Gordenker and her team. Crossing that grand hall for the first time and entering the first room you might be forgiven if tears spring to your eyes. These rooms contain the highest of Dutch and Flemish art, the highest of perhaps any painted art: Rembrandt, Vermeer, Breughel, Rubens, Hans Holbein the Younger, Van Dyck . . . some 800 works from the Royal 'Cabinet' of paintings. The ecstatic art crowd has now thinned slightly. In the morning particularly you will be able to commune with these paintings at a pace that suits your vision of them. I've mentioned the light. The more I visit the Netherlands the more I realize that light is the constant factor in everything Dutch. The country's relative flatness means that light pours from above. The presence of canals and lakes reflect even more light, sparkling with light even on the greyest day. None more so that here at the Mauritshuis. It was light that first inspired this art: light from the sky, from the windows, from the paintings. This triple light source is somehow captured here in the museum for the lighting too is art here. From the moment you enter you are presented with an architectural tour de force. 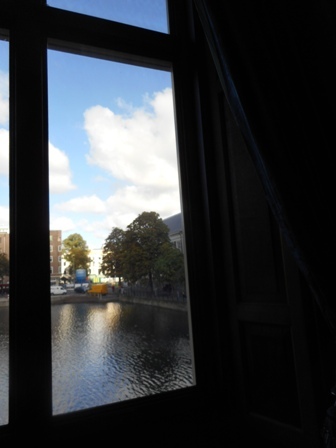 As you descend you will pass the sparkling surface of the adjacent Hofvijver Lake, presented with a flourish through a series of windows the firm have pierced into the retaining wall. You are descending below the water surface. 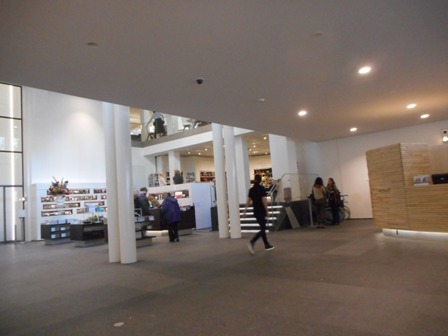 The foyer contains ticketing, cloakroom, audio guides, the timetable for free art tours, information desk, a shop and a brasserie. In the galleries themselves, light floods in from the draped windows (see above). The effect is somehow to return the viewer to the context in which these works were painted: a softly lit interior (candlelight in effect) with, outside, the brightness of a Dutch cityscape. The harmonious brick patterns, tiling and ornate ironwork of the Binnenhof (the Dutch parliament) and the Noordeinde Palace beyond. Lighting is effected by LED systems that are specially calibrated to combine daylight with the period glow of candles. So daylight can flood the visitor's eye but is not allowed to get anywhere near the paintings, all of which are treated like the individual little prodigies they are and bathed in their own special LED light. These are the painters whose painted light still enthralls all who see their work. I will post more about the paintings themselves in part II. Open daily 10am-6pm (to 8pm on Thursdays).